At St. Petersburg economic forum, Viktor Vekselberg, president of Skolkovo Innovation Center, signed a number of agreements with leading hi-tech firms and institutions such as Nokia Corporation, Simens AG, IBM, Massachusetts Institute of Technology. With over 60 companies on board and a host of MNCs and research institutions coming in, Skolkovo is set to be Russia's innovation city. Skolkovo, a Silicon Valley-type hub near Moscow, is what Russian President Dmitry Medvedev hopes will be the Noah's Ark for Russian's oil-surfeited economy: Put the best scientists and engineers, several promising startups and major international corporations in a to-be-constructed town, add global and local technology leaders and Nobel Prize winners to oversee the process, and you have a recipe for a successful new economy. A year and a half after the president finalised the location of the country's new innovation site, companies that joined the project have continued to remain optimistic, while others have preferred to observe from afar, content with their Russian business and contribution to the economy. Currently, there are several ways for companies of all shapes and sizes to participate. Participants should be from one of the five areas of innovation outlined by Medvedev in June 2009: nuclear and information technologies, space, biomedical research and energy efficiency. The primary way for the companies to participate is through "residency" — a commitment to be physically present in the Skolkovo compound once the construction of the innovative city is completed in 2015. There are now 60 signed residents on the Skolkovo roster split between three sectors: IT, biomedical research and energy efficiency. Among the first residents to be chosen to participate in the project was Innograd Pushchino, whose project envisages using biotechnologies to discover and neutralise highly dangerous infections. Residents also include IT companies such as Parallels Research, which will be setting up a cloud-computing center in Skolkovo, and Almaz Capital, which pledged 900 million rubles ($30 million) to create a business incubator. 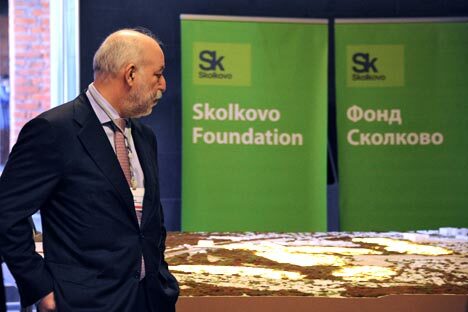 Multinationals, research institutions and universities with big names are participating by performing an oversight role as a part of the Skolkovo Foundation, the project's advisory council, the board of trustees, the town planning board or by signing memorandums of understanding concerning future cooperation. Among such companies are global IT giant Cisco Systems, which promised to invest $1 billion in Skolkovo during Medvedev's visit to California last summer. Now the company is one of Skolkovo's most faithful promoters, promising to increase its support of local IT education by ramping up the number of its training centers in Russia from 125 to 650 by 2015. "We also see ourselves as residents in 2011 if everything goes as planned," Andrei Zyuzin, who is driving cooperation with Skolkovo on behalf of Cisco, said. "This project is purely commercial for us. The reason we are here is to create an ecosystem for innovation in Russia," he said. Zyuzin is optimistic and answers sceptics that initial results of the project will be visible in four to five years, and that in seven to 10 years, it will be possible to judge whether the company has taken the right course with the project. Google chairman and chief executive Eric Schmidt decided to get involved by joining the Skolkovo Foundation council. The company's participation might not be limited to Schmidt's chairmanship. "We support this project and hope to be useful in it," said Alla Zabrovskaya, Google Russia's spokeswoman. Companies like Yandex, which triumphantly listed on NASDAQ and is now a poster child for successful innovation ventures, are more cautious when talking about Skolkovo. "The Skolkovo project is designed for startups, new companies for which special conditions and benefits are needed. Yandex, after all, is a fully formed company with its own unit called Yandex," the company's press office said. Hewlett-Packard, which boasts a large presence in Russia, has so far been reluctant to participate in Skolkovo in any way, saying that Skolkovo has yet to prove that it can compete globally with other innovation hubs. The Association of Computer and Information Technologies companies, or APKIT, an IT lobbying association, is sceptical. "Not to be a nihilist — it is good that the government is trying to support a non-natural resources economy," but if it really wants to support the IT industry, it should lower taxes and create conditions for preparing the workforce, said APKIT head Nikolai Komlev.